The "State of Marketing" report from Salesforce, focuses on four emerging trends: CX, the use of more customer data sources, AI and real-time customer engagement. Does your business have attribution under control? Here's five tips for a better attribution strategy. Get comfy and catch up with Chief Marketer’s most popular B2B and martech stories for November 2018. Data and its impact event marketing was the topic of a recent roundtable featuring experts from HP and Intel. A preference center can be a great opportunity for marketers to collect additional data about customers and finely personalize email content. 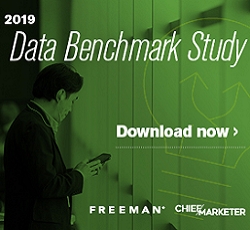 An industry benchmark study is the core of a B2B thought leadership strategy for Building Engines. Put on a mask, unwrap and treat and check out our top 10 B2B and martech stories for October 2018. Gated content is one way to build your lead database, but B2B marketers need to resist the powerful urge to gate everything. Do you have the right data strategy in place to create customer engagement and trust? Here’s three crucial things to remember. AI is continuously evolving, and with it, marketer’s ability to construct highly insightful campaigns.